Where do I use my Glenmuir voucher code? Although Glenmuir have dressed some of the most respected golf players in the industry they are also equally as proud to see their clothing at local clubs on golfing beginners and professionals alike, of every level and generation. If you’re looking for stylish golfing attire you can find shirts, knitwear, outerwear, mid layers, trousers and accessories for both men and women in various different colours such as black, blue, brown, cream, green, grey, orange, pink, purple, red, white and yellow. All of Glenmuir's golf clothing is made using the finest quality material including performance fabric, cotton, lambswool, merino wool and cashmere. All these materials provide both comfort and support during your golf games to ensure you look and feel your best on the course. Shop for your clothes based on your desired look, and check out gifts and gift vouchers too. If you’re looking for affordable golf wear you can find tons of discounted items in the sale section. Save up to 50% on men’s and women’s golf clothing, accessories and gifts and buy something stylish and high quality for yourself or a fellow golfing fanatic. You even have the option to personalise certain items to make them even more special and unique. Glenmuir are proud to say that their clothing has been worn by champions at Augusta, by winners of the Claret Jug, by gladiators of the Ryder Cup and on the world’s leading golf courses. The European Ryder Cup Team have worn Glenmuir shirts and knitwear ever since Europe's first win on American soil in 1987 at Muirfield Village, right up until the 2014 Ryder Cup Matches in Gleneagles, Scotland on the PGA Centenary Course. Discover official Ryder Cup merchandise worn by successive Ryder Cup teams online at Glenmuir. Find pieces dating all the way back to 1987, plus items from every year since including new stylish pieces from this year too. Check out the Glenmuir news and press section for information on everything from collection launches to company announcements. Learn about the charities Glenmuir work with as well as their new in pieces and collections from this season. Discover new performance materials and luxury items that have been added to the Glenmuir catalogue and learn how to enhance your shopping and buying experience with the new features on the Glenmuir website. Stay up to date on all things golf with the many articles available and discover new articles every week that feature loads of advice on golfing attire and golfing activities. What is Glenmuir’s returns policy? Any unworn/unused item(s) in its original packaging and condition can be returned for a refund within 28 days of receipt. How can I contact Glenmuir? Glenmuir is a family-run business dedicated to producing the finest golf wear at affordable prices. Discover golf wear for both men and women, all of which is expertly crafted and stylish while remaining practical, allowing you to perform well while looking great and feeling comfortable. 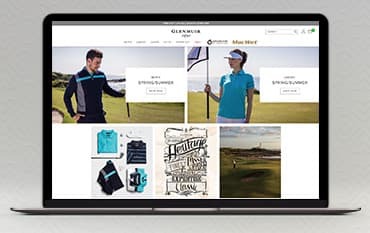 Shop online at Glenmuir and discover golf clothing, accessories and gifts in various colours and materials and make sure you use a Glenmuir discount code from us to save money on your purchases.